Sandwiches come in either a white or wheat pita pocket. Wraps come on a white or wheat thin pita wrap as well. If you would like to have gluten free slice bread substituted for pita, there is an up-charge of $1.50 for a small sandwich and $3 for a large sandwich. A combination of thinly sliced meats marinated in spices and grilled to order. Served with tomato, onion, Lebanese pickles and lemon tahini dressing. 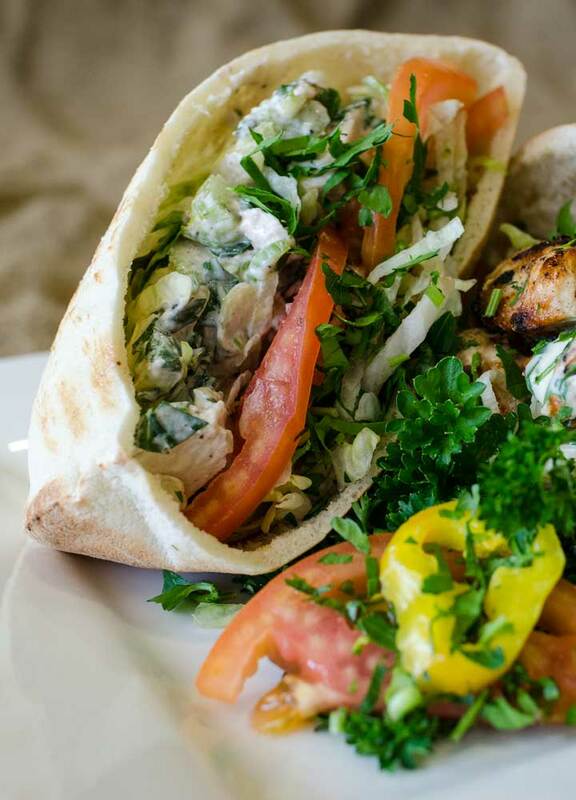 Charbroiled chicken (halal), beef or kafta kabob, served hot with hummus, lettuce, tomato and house dressing. Charbroiled lamb (halal) kabob, served hot with hummus, lettuce, tomato and house dressing. Our signature chicken salad served with lettuce and tomato on a pita. Our Mediterranean chicken salad made with grilled chicken, tomato, lettuce, scallions, garlic, jalapenos, balsamic vinegar, lemon juice, and parsley. Served over mixed greens in a pita wrap. Turkey, Ham or Roast Beef, served with a three cheese blend, lettuce, tomato, pickles, banana peppers, mayonnaise, mustard and house dressing. A flavorful vegetarian patty made from a blend of chickpeas, onion, garlic, sesame seeds, herbs and spices, fried in vegetable oil and served with lettuce, tomato, pickled turnips and lemon tahini dressing. A lean ground beef patty made with spices, pinenuts, onions and bulgur wheat. Served warm with hummus, lettuce, tomato, pickles, banana peppers and house dressing. Lean ground beef patty with spices, parsley and onions served on pita buns with tatziki, spring mix and tomatoes. Fried veggie patty made with chickpeas, pinto beans, black beans, quinoa, and seasonal veggies. Served on pita buns with hummus, spring mix and tomatoes.